Have you ever imagined yourself on the other side of the blackjack table, dealing the cards, maneuvering the chips, winning most of the hands without ever considering strategy? It’s not for everyone. In fact, many have called it the hardest job in the world. Not only are you bound to very strict rules and unwavering hand movements, you are the object of every loser’s undying hatred. Today, we’ll take a glimpse into the world of blackjack dealing through the eyes of those who’ve experienced it first hand. According to one of the most experienced dealers in the world, being a professional card dealer isn’t just a career choice, “it’s an adventure”. Meet Colleen Kubiak. She’s not just a professional card dealer. She’s also a teacher of the trade. She’s been dealing for 25 years now, and calls herself a casino “lifer”. But she wouldn’t trade that life for the world. Mrs. Kubiak recently took on a new adventure, sharing her experiences with Daniel Axelrod of the Times Harold-Record. His mission wasn’t just to get an interview with a pro dealer, but to learn what it’s like to master the art… Okay, maybe master is a strong word. He did get a first-day training session, and as he put it, his top priority was “not to embarrass” himself. Fortunately, Mrs. Kubiak, now in her 50s, was in a jovial and forgiving mood. That’s one of the requirements of a dealer, you know. They must be able to remain positive, if not enthusiastic, regardless of the situation. With a “funny, kind, self-assured” attitude, she has that down pat. One of the first things she asks her students to do is, “Yank the 10s out of the deck, and practice adding the cards”. The math side of the job is crucial. If you can’t get down the math with flawless precision, all the shuffling, card sliding and chip handling skills in the world won’t help you pass a casino’s audition. Oh, and shuffling isn’t called shuffling. It’s called ‘riffling‘. Chips aren’t chips, either. Kubiak explains that they’re referred to as ‘checques‘, “because they’re like an uncashed check. They have value”. Once you get the math and terminology down, there’s still that matter of precision card and chip handling to master, but the expert says that’s the easy part. “Dealing is muscle memory,” she said. It takes nothing more than consistent practice to acquire such skill. Anyone willing to dedicate the necessary time to practice can do it. And it’snot just blackjack, but all table games – craps, roulette, baccarat, pai gow, 3 card poker, etc. 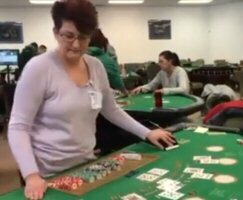 For those who make it through the training session – Kubiak’s classes last 6 weeks, with 5 hour-per-day sessions – and pass the mandatory background check, all that’s left is to apply for a casino dealer job. They’re in high demand these days. Kubiak’s sessions are brimming with applicants hoping to land one of the 600 jobs coming to Resorts World Catskills next month. For her, it’s been wholly rewarding, from the moment she nervously passed her first audition. “I felt connected to something,” she told the journalist-turned-dealer-(not-so-)extraordinaire. “Every casino becomes a family, and we readily take in new members.